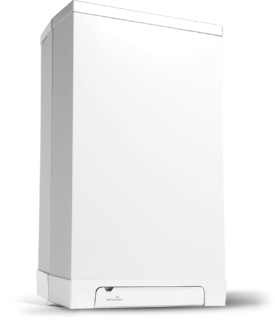 Combining high efficiency in both hot water and central heating modes, the Rapid retains all the benefits of Intergas’ revolutionary condensing boiler technology. It’s available in two power outputs to satisfy most domestic applications. All parts in the Rapid boiler are easily accessible as the boiler case is removed from the front and, with the built-in expansion vessel, there is no need to use a jig. The Rapid has a 3-year warranty on parts and labour. All parts in the Rapid boiler are easily accessible as the boiler case is removed from the front and, with the built-in expansion vessel, there is no need to use a jig. Intergas provides a three-year warranty on labour and parts. With its state-of-the-art control system, the Intergas Rapid can be easily converted to a ‘heat only’ or a ‘sealed system’ boiler. Every Intergas Rapid boiler features our unique back-to-back,two-in-one heat exchanger that reduces heat losses and delivers the optimum heat transfer for an exceptionally economic performance year after year. Separating the circuits for heating and hot water also means there’s no need for a diverter valve or secondary domestic hot water plate heat exchanger, eliminating the source of possible future component failure.